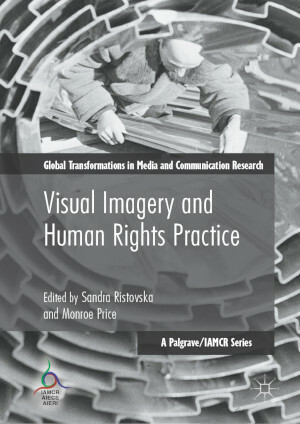 Edited by Sandra Ristovska and Monroe Price, Visual Imagery and Human Rights Practice examines the interplay between images and human rights, addressing how, when, and to what ends visuals are becoming a more central means through which human rights claims receive recognition and restitution. The collection argues that accounting for how images work on their own terms is an ever more important epistemological project for fostering the imaginative scope of human rights and its purchase on reality. Interdisciplinary in nature, this timely volume brings together voices of scholars and practitioners from around the world, making a valuable contribution to the study of media and human rights while tackling the growing role of visuals across cultural, social, political and legal structures. This is the seventh title in the Palgrave/IAMCR book series Global Transformations in Media and Communication Research and will be of great interest to scholars of media and social movements studies as well as of contemporary politics. Sandra Ristovska is Assistant Professor in Media Studies at the College of Media, Communication and Information at the University of Colorado Boulder, USA. Monroe Price is Professor at the Annenberg School for Communication at the University of Pennsylvania, USA, and was director of its Center for Global Communication Studies. Both are members of IAMCR, as are many of the chapter authors. This is the seventh title in the Palgrave/IAMCR book series Global Transformations in Media and Communication Research. IAMCR members are entitled to a special 35% discount on all titles in the series. If you are a member of IAMCR, email GlobalTransformations [at] iamcr.org (Subject: global%20transformations%20discount) with "global transformations discount" as the subject of your message for details on how to get your discount. Go to the publisher's website to purchase a title in the series.